Whilst the Nikon brand name was first used in 1946, it was really in 1917 when three of Japan's leading optics manufacturers merged to form a comprehensive, fully integrated optical company known as Nippon Kogaku K.K. It was only a year later when they started optical glass production and research and in 1921 the first binoculars were produced: The MIKRON 4x, 6x, ultra-small prism binoculars. Today the Nikon brand name is probably best known for it's cameras, but they also have such a huge range of rifle scopes, spotting scopes and binoculars, it is difficult to know where to start. From 2001 the Nikon Sport optics side of their business was reorganized and is an independent company and they now produce some of the best value for money binoculars, riflescopes, rangefinders, spotting scopes and digiscoping equipment on the market. Nikon, like many of the other Japanese binocular brands tend to focus on technology and value for money, but without sacrificing quality. Their confidence in their products is reflected by the fact that many of the better spec bins carry an impressive 25-year warranty. Aimed at hunters, the Nikon LaserForce has an onboard laser rangefinder and boasts a full metal chassis, fully multi-coated optics and eco friendly lenses with ED glass elements. The LaserForce is currently only available in a 10x42 configuration. 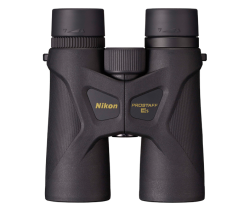 The Monarch 7 is currently Nikon's top of the range Monarch and as such comes with a whole host of very high end features and components that all add up to make a very impressive binocular. The main highlights of these roof prism bins include the use of phase correction and multi layer dielectric coatings on the prisms that help ensure the brightest, most natural looking and highest quality images are produced. What is more, the lenses are fully-multilayer-coated with anti-reflection coatings, which maximizes the amount of light that passes through them and gets to your eyes. One of the elements on their objective lenses is also made from ED (extra-low dispersion) glass that further improves the image by minimizing color fringing. Other coatings include a scratch-resistant one added to the outer surfaces of both the objective and eyepiece lenses helping protect them during day-to-day use and when cleaning. 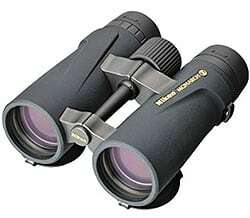 This is very wide and the 8x42 easily ranks u there with the very widest currently available and so will really appeal to birders, hunters, general wildlife observers and will make great sports viewing binoculars where it is desirable to be able view as much of the action as possible at one time. 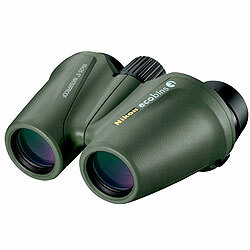 Both Monarch 7 Binoculars are fully O-ring sealed making them waterproof (tested to 1m/3.3ft. for 10 min). They have also had the internal air replaced with nitrogen gas to prevent the internal optics from fogging. The cap at the center of the pivot on the front of the binocular can be removed, revealing a standard thread allowing you to attach a tripod adaptor to them to allow you to then fix the bins to a tripod. News: Nikon announced the release of a new version of the Monarch 5. Many features and components remain the same. Changes include a new body design that looks very similar to the latest Monarch 7. It is also lighter and now includes ED glass lenses. For more details, read this article on the announcement of the New Nikon Monarch 5. Nikon Monarch 5's now also available with 56mm Objective lenses. Click here for more. 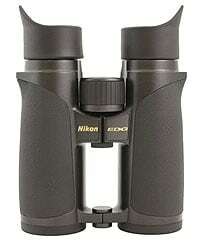 As far as I have been able to find out, the Monarch 5 is an update of the very popular Nikon Monarch ATB range. All models are available in black or a camouflage and all have 42mm objectives which come with a 8, 10 or 12x magnification. 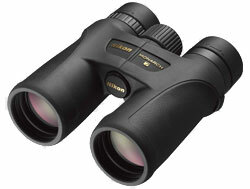 This is one of Nikon's higher spec ranges and one of their real features is that all Monarch 5 All Terrain binoculars come with very highly reflective multilayer dielectric coatings on their roof prisms, which for me is a major, but very pleasant surprise for a binocular in this price range. Other high end optical features include phase correction coatings on the prisms, fully multi-coated optics which are made using Nikon's Eco-Glass that does not contain any lead or arsenic. The exterior is covered in a full rubber armor and as you would expect, the body has been O-ring sealed to make them fully waterproof. The air inside has also been replaced with nitrogen gas to ensure that the inner lens surfaces never fog up. 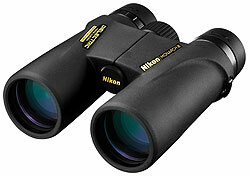 Nikon Monarch 5 or Pentax 9x32 Binoculars for Safaris? 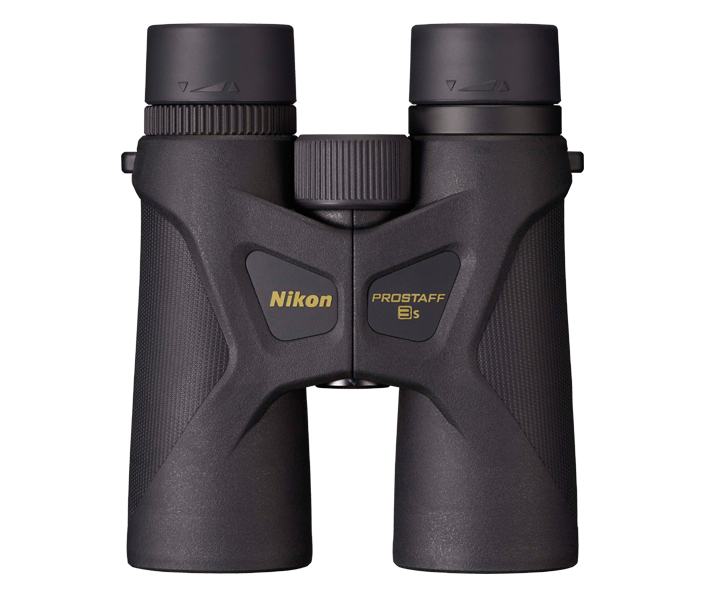 Squarely aimed at the low to mid range market of users looking for a good performance from a full sized 42mm binocular Nikon's new ProStaff 3S binoculars come in either 10x42 or 8x42 configurations. Features include multi-position twist-up eyecups silver coated roof prisms, multi-coated lenses and a fully O-ring sealed, nitrogen filled body that is both water and fog proof. 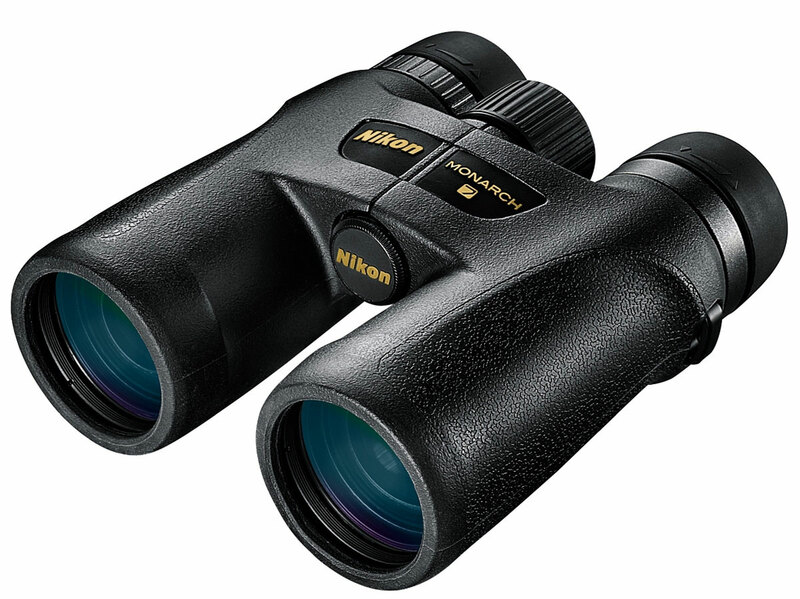 Nikon's most popular range of binoculars combine quality and performance at a price point that has made Monarch ATB binoculars one of the best selling ranges of binoculars in the world. 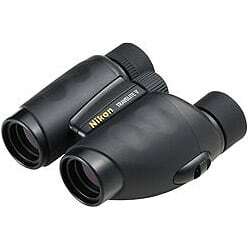 Within this largest series of binoculars from Nikon they have a pair for almost everyone from professionals to occasional users in almost any application. 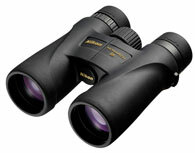 All Monarch ATB binoculars are both waterproof, fogproof with great quality optics for almost any weather and light conditions and the Arsenic and lead free Eco-Glass lenses are not only good for the environment, but come with multi-coating and phase-correction prisms result in optimum brightness and resolution. An oversized focus knob enables quick and easy focusing and turn-and-lock eyecups with good eye-relief, for use with and without eyeglasses. The most popular model within the range is the Monarch 8x42 ATB that has 8x magnification and 42mm objective diameter lens featuring multilayer-coated lenses of the highest quality for beautifully defined images, O-ring seals and nitrogen gas for added resistance to challenging environments, and a durable design with rubber armouring for a reliable performance and comfortable grip. There is also a camouflage model that uses a high-definition printing process for the effect and which gives hunters an edge in areas where green is the predominant color. 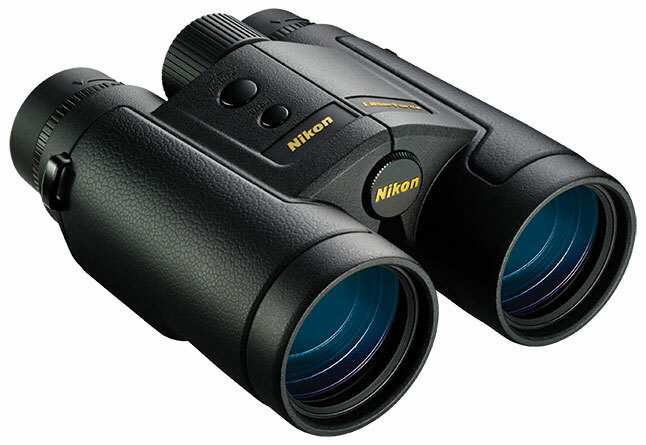 Aimed at the outdoor enthusiast, these are Nikon's flagship binoculars and as such the Nikon EDG binoculars use the highest quality optics with Nikon’s exclusive ED glass NIKKOR® lenses to offer extremely bright and high contrast images. Nikon's EDG optics use Extra-low dispersion (ED) glass for chromatic aberration compensation for brighter and clearer viewing. This technology is also used in their high end spotting scopes. The EDG series of binoculars come in two different objective lens diameters (42mm and a more compact 32mm). 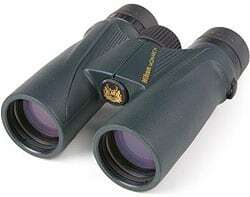 The most popular binocular within this series would be the 8x42, which make ideal bird watching binoculars and the 10x42, perfect for all types of nature, wildlife and sporting observation. All EDG binoculars are O-ring sealed and dry nitrogen-filled to withstand any weather conditions and come with Horn-shaped detachable eyecups that are ergonomically countered to block out peripheral light. 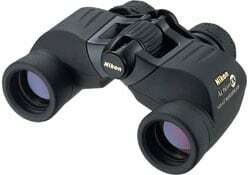 Nikon EDG Binoculars – Value for Money? If you are not sure which EDG binocular to go for, this chart, that compares the main specifications of the Nikon EDG range may help. For example it is interesting to compare the field of views between the 8x and 10x models, making it obvious why most bird watchers, where field of view is important opt for an 8x magnification. 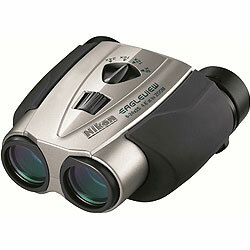 The Nikon Monarch X series combines the latest advancements in construction with optical technology. The main features of the the Monarch X include Nikon's advanced dielectric high-reflective multi-layer prism coating, formerly available only on the EDG binocular range, giving you brighter, more crisp images in low light conditions of dusk and dawn. The Multi-position click-stop eyecups allow the Monarch X Binoculars to be used with or without eyeglasses. Nikon Monarch X binoculars are both waterproof and fogproof and feature an enlarged central focus knob for extra fast focusing. The body construction is both lightweight and strong weighing just 26 ounces and the rubber-armored coating provides excellent non-slip grip in any environment. At the time of writing, there was only one model within the EagleView Zoom series, a good looking, but inexpensive compact porro prism zoom binocular that has a centrally located zoom control lever that enables the user to select any magnification from 8 power to 24 power with the push of a finger. This fairly compact and lightweight zoom binocular comes with Multilayer-coated lenses that produce what I thought was a good quality as well as bright image for it's class, especially at the 8x magnification setting. Other highlights include a "carbon fibre material" in parts of the grip that are said to enhance durability and parts contain eco-friendly materials. 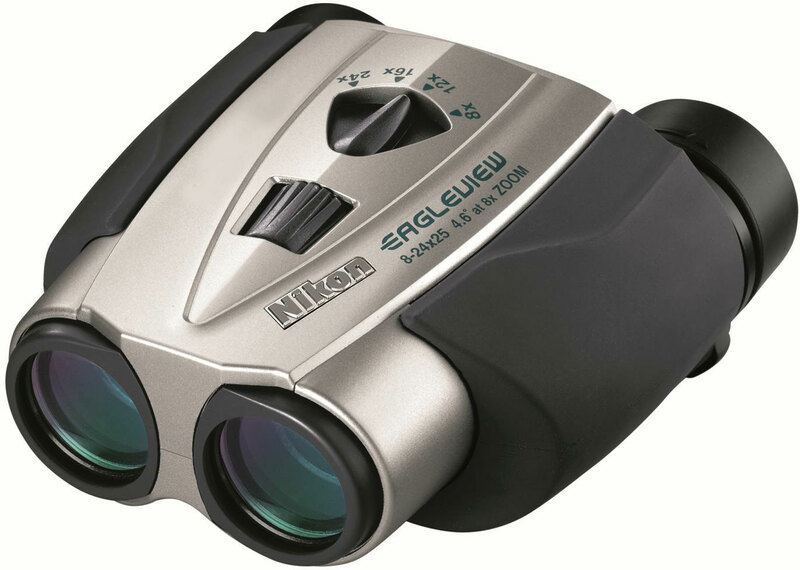 Nikon say that they are committed to protecting the environment and have started to produce binoculars that have been manufactured with the environment in mind. The Ecobins Binoculars are made with premium optics made from Eco-friendly, lead-free glass, non-chloride rubber and no harmful inks or dyes. What is more, each binocular comes with a 100% natural Lenzing fiber case and strap, Fiberstone Tree-free packaging and includes a donation to the National Audubon Society. The Travelite V series of compact porro prism binoculars all feature a very comfortable ergonomic body made from light and durable carbon fibre with a tough rubber armor coating. The range of magnifications range from 8x to 12x and the Nikon Travelite V Zoom Binocular takes you from 8x right up to a 24x magnification. All Travelite binoculars have 25mm objective lenses. Like most Nikon binoculars, the focus in this series is on technology as well as value for money and all without sacrificing image quality. Consisting of six porro prism binoculars ranging in magnifications from 7x to a very powerful 16x binocular that is ideal for long distance observation, all Action EX binoculars offer a bright image and relatively wide field of view. 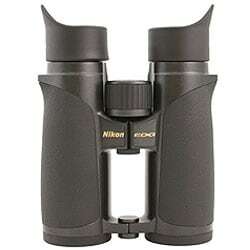 As you can clearly see on this page, where I have only listed a fraction of what they produce, Nikon Sport Optics have an extremely wide selection of binoculars that range in price from well over $3000, right down to many that cost less than $50. Within all these price points, they have models that are perfect for almost any activity or use that you can think of including bird watching, hunting, wildlife, travel, marine use, security, astronomy, and general use. However this large selection can make it almost overwhelming and somewhat difficult to select the ideal instrument for you, your needs and at your budget. 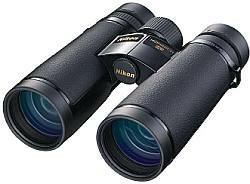 In this article I have selected what I feel are the perfect Nikon binoculars for bird watching in a range of price points and sizes.